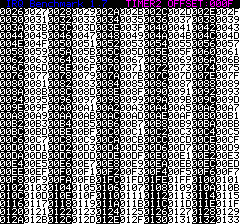 So as you can see the TIMER2 OFFSET is now identical between the two versions ($0011), the SEI tests return exactly the same number of cycles as well ($4E33). There are still some differences, but they are being worked on. 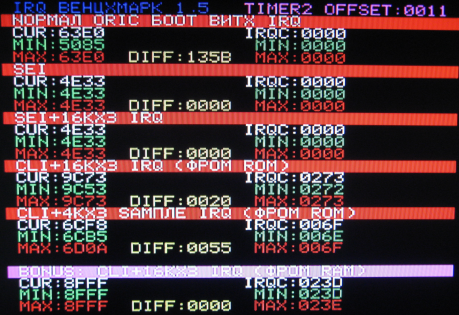 As you can see, in both cases the ROM IRQ has a matching minimum, and the maximum is very close. 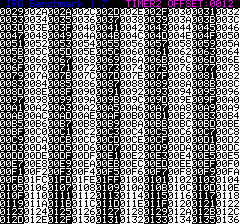 The "SEI" cases are identical, as are the 16KHz cases. Everything is spot-on except for that pesky sample routine now! 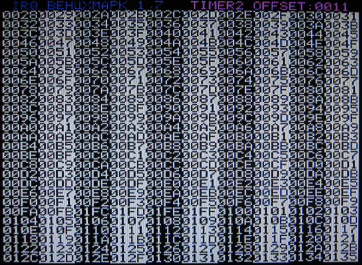 (the same is true in ROM-only mode). When calculating instruction cycles, (zp,x) and (zp),y page boundary checks got broken at some point. Also "INC zeropage" was in the wrong part of the switch statement. 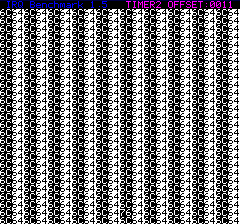 So, some more tests, this time I tested specifically if the actual timing of the sample replay code is taking the same time on the various machines. Ha, 1008, I was doing my tests with version 1007, guess I could take a look at what the results are with the new version. 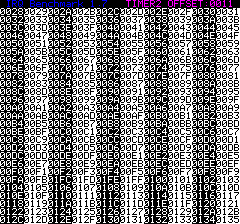 I was thinking of perhaps writing an article about that in the CEO Mag, with first things related to the timings in emulators, and then second how to profile/time your code (without having to do manual clock cycle counting). Do you think André would be interested? There are so many different readers of the CEO Mag that any subject might be interesting for at least a few readers. Yesterday I was trying to figure out why the last test was giving different MAX results for the sample player (about 250 cycles difference) while all other tests gave correct results. As far as my tired eyes can tell, Oricutron gives absolutely the same result as the Pravetz, including the broken values: 00FA 00FB 01FC 01FD 01FE 01FF 0100 0101 0102 0103 0104... (guess I need to learn how to read the timer correctly if I want to make a decent profiler, but at least the emulator correctly emulates my crappy code). Mess is consistent, starts with two missing cycles, and consistently misses two cycles everywhere. Euphoric is globally once cycle too large, but there are also some strange things like double values (2A 2A) and backward sequences (5C 5D 5E <b>5C<b> 60). Well, I know why we get a 6DB5 result in Oricutron. 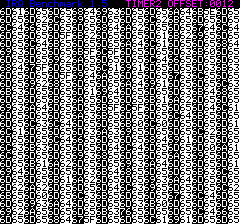 Quite late into the benchmark, we get what should be a 6CB5 run, but the Timer 1 interrupt kicks in right in the middle of the timer 2 read code. 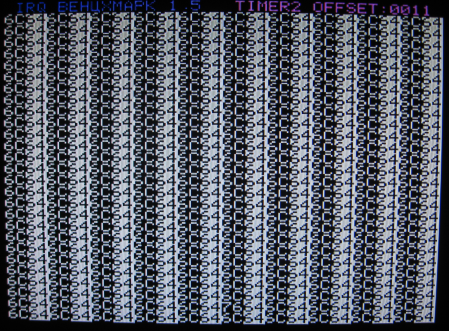 So, it loads the low 8 bits into A, the interrupt kicks in, THEN it reads the high 8 bits into X. The interrupt takes long enough for the high byte to change, so thats why you get $6DB5 instead of $6CB5. 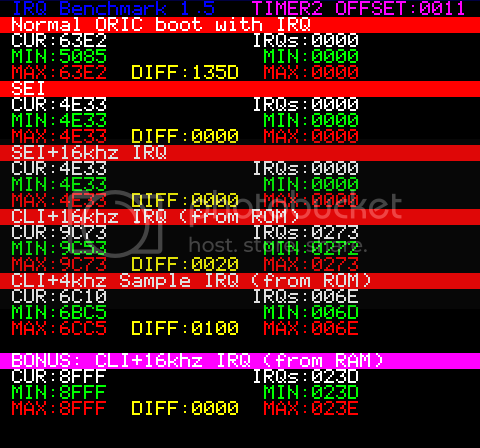 Now, since the VIA/CPU interractions are supposed to be cycle exact, we should get an identical run to the real hw, so I need to figure out how my timers differ from the real hardware. Last edited by Xeron on Thu Aug 18, 2011 6:29 pm, edited 1 time in total. I guess I will have to fix the timer reading by adding a php/sei/read/plp to the code, but indeed it should be similar to the real hardware. 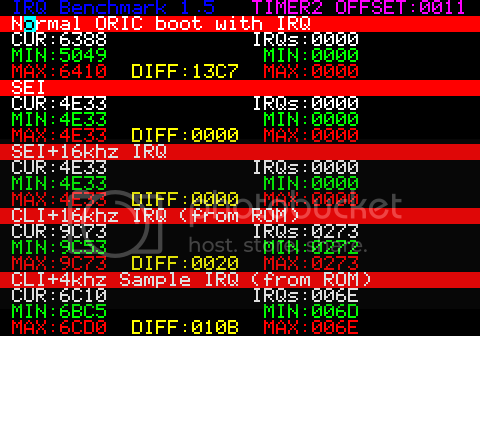 Is it possible that the IRQ flag got detected later on the real 6502? 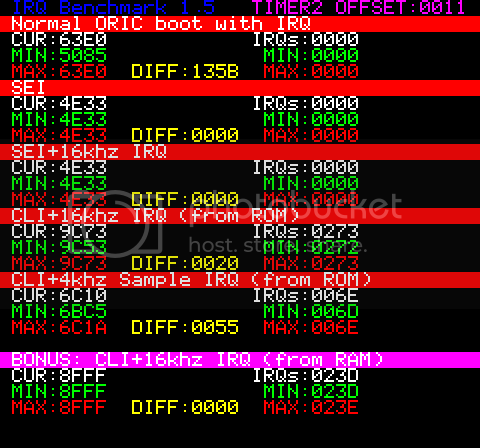 Good news for all the users of Euphoric, the results of the build 1013 (you can fetch it on http://oric.free.fr/emulator.html) are now much better. 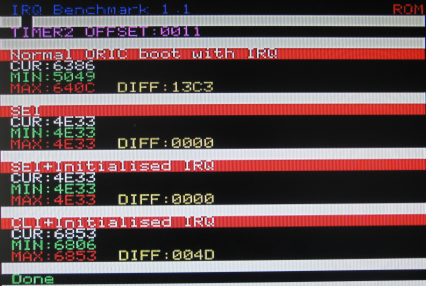 - the SEI tests correctly give $4E33 independently of if the IRQ is setup or not. 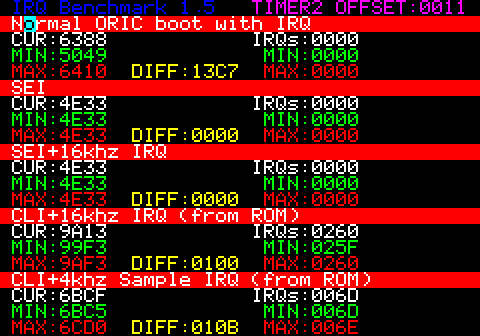 The only values that are still wrong are the number of emulated IRQ on the high frequency timer tests, not sure if this can be fixed, but that's definitely an improvement.